Elsewhere in men’s hockey, there were a couple of big upsets in the Top 10. The No. 1 UNB Varsity Reds fell 3-2 to the UPEI Panthers Wednesday, with Nathan Yetman, R.T. Rice and Beau McCue scoring for UPEI. The Panthers haven’t had a great season overall against a tough Atlantic University Sport schedule, with Wednesday’s win only improving their overall mark to 7-17-1, but they’ve proven able to hang with anyone on a particular night; they also posted a 3-2 upset of the StFX X-Men (ranked No. 4 at the time, No. 1 soon after) back on Jan. 5. UPEI capped off their weekend with a 4-1 win over the Moncton Aigles Bleus Friday, while UNB beat Moncton 7-4 Saturday. And the UBC Thunderbirds came up with an impressive pair of home wins over the No.3 Saskatchewan Huskies, earning 5-1 and 3-1 victories. UNB then beat SMU again Saturday, winning 94-85. Masters had only nine points in that one, boosting his career total to 3,005, but said afterwards his scoring totals weren’t the important part. "Nine points, it doesn't matter. We got the win, that's what matters. Tyronn (King) played very well. Hess (Mayele) played well. It's not only me that can score baskets. It wasn't just me. We can impact different ways in a game, so I'm happy for those guys." Elsewhere in men’s basketball, the Lethbridge Pronghorns came up with a 91-89 overtime home win against the No. 4 Calgary Dinos Thursday. Lethbridge’s Zac Overwater led all scorers with 29 points, while teammate Saren Westrop added a double-double with 23 points and 12 rebounds. And on Friday, the Bishop’s Gaiters bested the No. 5 McGill Redmen 86-81, led by 24 points and 12 rebounds from Abdul Kamane. On Saturday, Calgary bounced back with a home 97-71 win over Lethbridge, while McGill beat Bishop’s 108-57, the Redmen’s largest margin of victory in conference play since a 94-39 win on Jan. 14, 1977 (which was also against the Gaiters), aided by a school-record 74 points off the bench. There was an impressive landmark hit in women’s volleyball this weekend as well, with long-time McGill Martlets head coach Rachele Beliveau earning her 600th career victory Sunday as No. 8 McGill bested the Ottawa Gee-Gees in five sets (20-25, 23-25, 25-16, 25-22, 15-12). "It's only when I saw the (promotional) sign on the wall that I remembered (that the milestone was within reach)," said Beliveau, a former Canadian Olympian who owns a 600-507-2 overall record in 1,109 contests overall during her 27 years at the helm of the Martlets program. Although national records are incomplete, Beliveau -- who has more victories than any coach, regardless of sport, during McGill's lengthy athletics history -- appears to be the third women's volleyball coach in U SPORTS history to reach the 600-win plateau, behind Manitoba's Ken Bentley (1,037 in 32 seasons) and Alberta's Laurie Eisler (750 in 26 seasons), both of whom are still coaching. "You really focus on what you have to do and on the game. The same as an athlete - our game preparation (as coaches) is different but you have to prepare options for what you need to do, if things go wrong. You have preparation to do, so you're focused on the game (not the milestone). I thank McGill for giving me the chance and the opportunity to coach here." 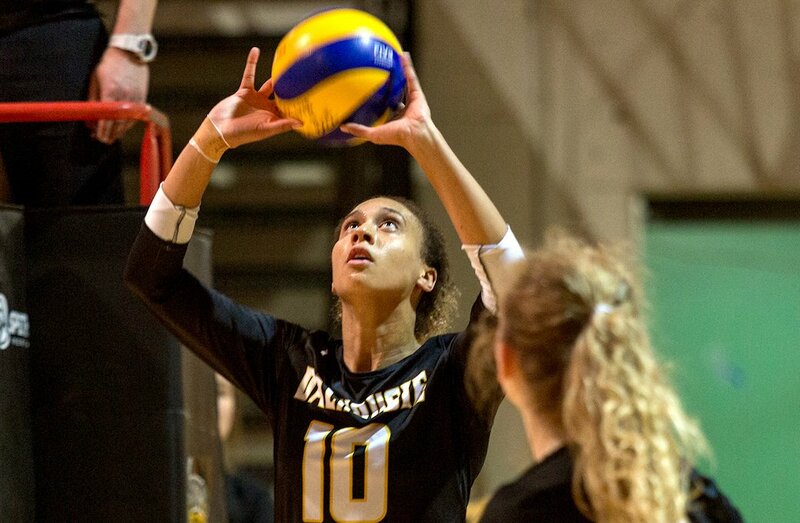 That was a nice bounce-back win for the Martlets, as they lost on the road in five sets (25-22, 15-25, 25-16, 23-25, 9-15) to the crosstown UQAM Citadins Thursday, losing their six-game win streak in the process. Elsewhere in women’s volleyball, the Brandon Bobcats upset the No. 1 UBC Thunderbirds (25-23, 25-23, 17-25, 25-23) Saturday behind 22 kills and 11 digs from Nikala Majewski (including eight kills in the final set). That gave them a weekend split following UBC’s 21-25, 25-19, 25-13, 25-27, 16-14 victory Friday. The Calgary Dinos came up with an impressive Crowchild Classic win at the Saddledome Thursday on the women’s side as well, triumphing 1-0 over the Mount Royal Cougars thanks to a 27-save shutout performance from Kelsey Roberts and Cheyann Newman’s goal on a tip of a shot from Merissa Dawson. Newman also scored in last year’s Saddledome game (a 3-1 loss for the Dinos). This time around, her goal was the difference. Elsewhere in women’s hockey, the Saskatchewan Huskies came up with a pair of impressive home victories over the No. 3 UBC Thunderbirds. On Friday, Huskies goaltender Jessica Vance recorded her third straight shutout with 13 saves in a 2-0 win, with Leah Bohlken and Emma Nutter scoring for Saskatchewan. On Saturday, the Huskies emerged with a 2-1 shootout win, with Vance making 21 saves plus stopping all three shootout attempts. Logan Boyd scored for UBC in the second period, while Kennedy Harris scored for Saskatchewan in the third, and Kaitlin Willoughby notched the only shootout goal. A big upset in women’s basketball this weekend saw the No. 1 McGill Martlets fall 52-40 to the Bishop’s Gaiters on the road Friday. Bishop’s posted a 32.8 per cent field goal percentage, while McGill only connected on 23.3 per cent of their shots from the field. Edith Noblecilla led the Gaiters with 15 points (including five key free throws down the stretch), while Marie-Evrardine Berrouette had 10 points and 12 rebounds. Martlets star senior centre Alex Kiss-Rusk was held to a career-low four points on 2-of-14 shooting (although she did have 11 rebounds) thanks to tough defence from Bishop’s senior Mara Marchizotti, who finished with nine points, 11 rebounds and four blocks herself. This marked the Gaiters’ first win over McGill since Nov. 26, 2016. On Saturday, McGill struck back against Bishop’s at home, winning 66-57 behind a double-double (14 points and 15 rebounds) from Kiss-Rusk. Elsewhere in women’s basketball, the Cape Breton Capers’ Alison Keogh made some history Sunday, becoming Atlantic University Sport’s all-time career rebounds leader with 19 rebounds in an 88-78 win over the UPEI Panthers. And Keogh also had 34 points in that game, making her Cape Breton’s all-time leading scorer. There was a hotly-anticipated clash in men’s volleyball this weekend, with the No. 2 UBC Thunderbirds hosting the No. 4 Brandon Bobcats. On Friday, UBC triumphed in four sets, winning 25-19, 25-22, 21-25, 25-22 thanks to 13 kills and four blocks (one solo and three assisted) from Jordan Deshane. Keith West added 11 digs, four kills and three service aces for the Thunderbirds. On Saturday, UBC came up with a straight-sets victory, winning 25-11, 27-25, 25-22. West had a game-high 10 kills, while setter Byron Keturakis had 29 assists, nine digs and four blocks (one solo and three assisted). McGill hosted a giant track and field meet this weekend, with 18 university teams and 702 athletes participating. That included eight RSEQ teams, six OUA teams and four AUS teams. However, the host team didn’t do all that well, finishing ninth on both the men’s and women’s team side. The No. 1 Guelph Gryphons won both the men’s and women’s competitions, with Laval (ranked sixth on the men’s side and 10th on the women’s side) placing second on both sides. One particularly impressive performance came from Guelph’s Mark Emode, who set a fieldhouse and meet record in the men's heptathlon with 4,979 points. The Gryphons also set meet records in the men’s high jump (Sean Cate, with a mark of 2.16 m) and the women's 4x200m relay (1:38.89), while Laval’s Jessy Lacourse set a meet record in the women’s 1000m with a time of 2:47.09 (also a Quebec record for her age group). Full results are available here and here. There were a few notable swimming competitions this weekend, with the Ottawa Gee-Gees beating the Carleton Ravens in a dual meet at home and the Waterloo Warriors winning dual meets against the Brock Badgers and Laurier Golden Hawks. Ottawa’s meet saw their fifth-ranked men’s team win 11 of the 12 races they completed in, sweeping first, second and third in the 100 and 200-meter backstroke, as well as the 50-meter breaststroke. The Gee-Gees women’s team also won all 14 of their races, including sweeps of first, second and third in the 100-meter backstroke, 50-meter breaststroke, and the 50-meter freestyle. One big wrestling tournament this weekend was the University of the Fraser Valley’s Cascades Classic, which saw 108 wrestlers compete and the host Cascades take second on both the men’s and women’s sides. On the men’s side, the No. 1-ranked Alberta Golden Bears won with 35 points, finishing ahead of UFV (29 points), Regina (27), Saskatchewan (25), Calgary (21) and Western Washington (12). On the women’s side, the Saskatchewan Huskies claimed the title with 27 points, ahead of UFV (18), Alberta (9), Calgary (5), Regina (1) and Western Washington (1). One particularly notable results for the home team saw rookie Parker McBride win all three of his matches to take the 54-kilogram gold medal, including an 11-0 win over Alberta’s Jordan Wong (who had two previous wins over McBride this year) in the final. On the women’s side, Ana Godinez Gonzalez won both of her matches 18-0 to claim the 63-kilogram gold. Elsewhere in wrestling, the Western Mustangs hosted the Western Open, and teams like the Lakehead Thunderwolves sent wrestlers both to that and to the Ontario junior championships. That’s cool to see. This is a pretty remarkable record, and it’s great to see it get this kind of attention.